Hi there my friends! How are you doing with the cold temp’s this week? I don’t know about you, but with the colder temperatures I’m often looking for some comfort food and turn to root veggies or some sort of squash (trying to keep the calories down!). Do you remember growing up and having a tuna casserole for dinner? I recall eating that sort of thing from time to time. I stumbled upon this delicious recipe from Eating Bird Food and had to give it a try! I loved it so much that I decided to share it with all of you. 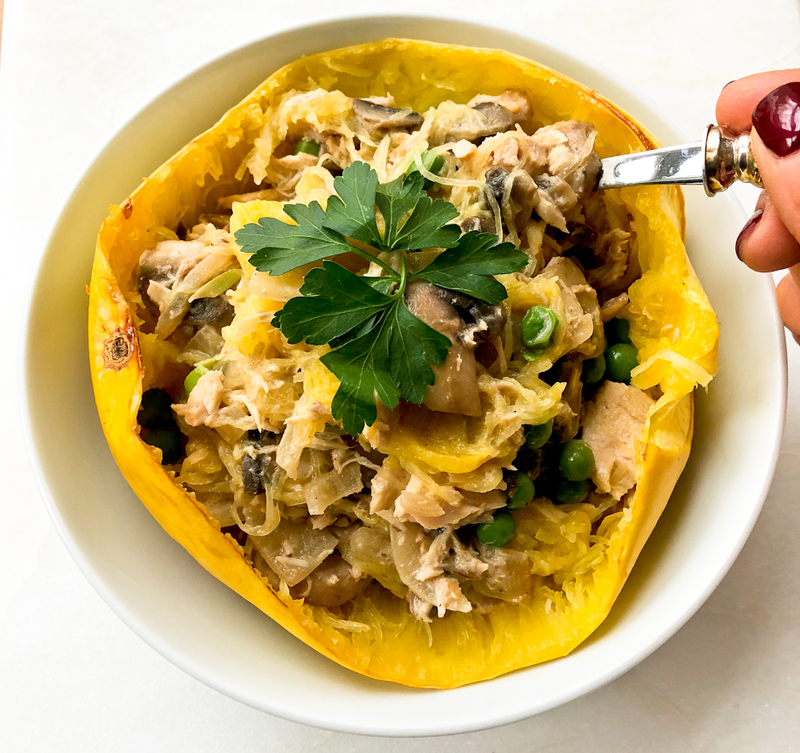 Spaghetti squash is one of my all time favorite vegetables. 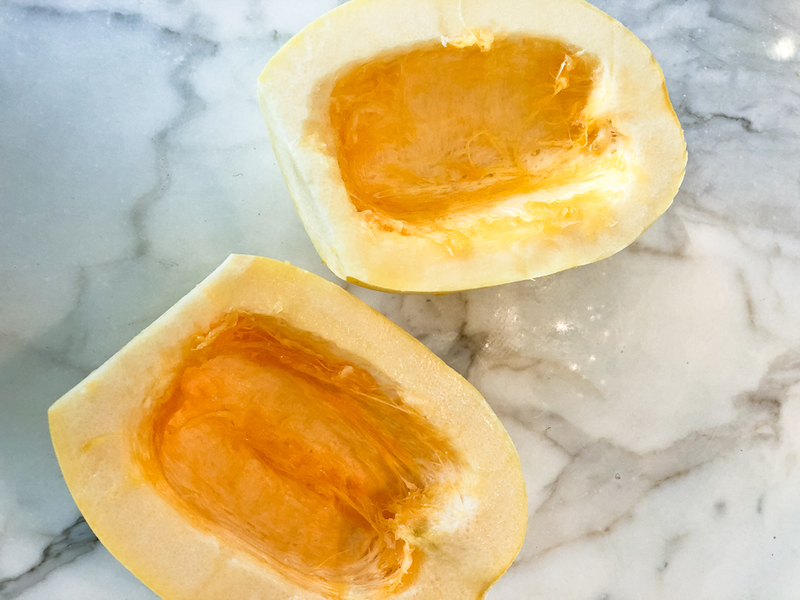 Not only is it so easy to make, super yummy, but for a squash, it’s very low in carbs! We all love that, right?? 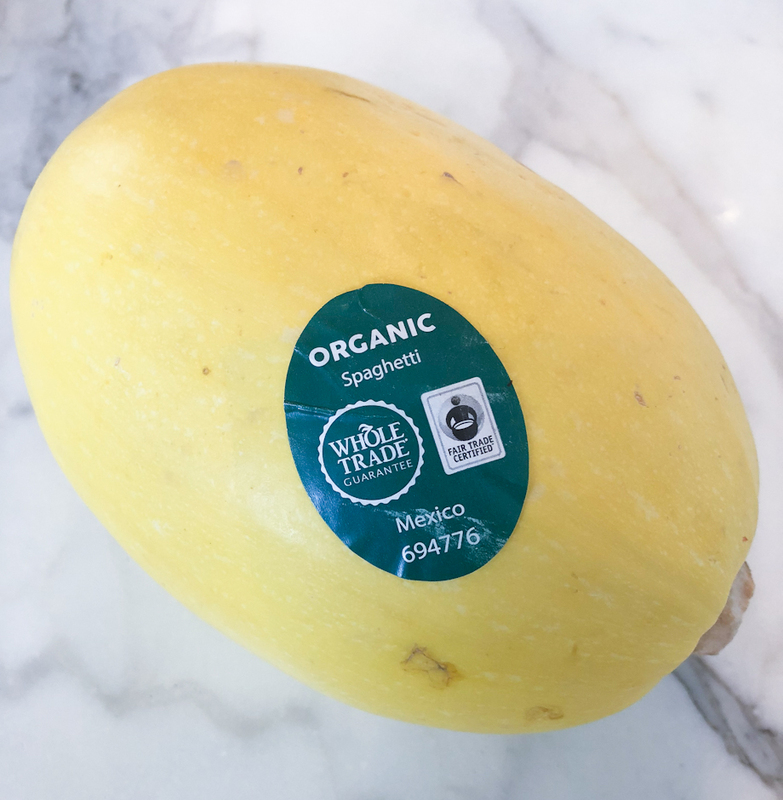 One cup of this squash only has 42 calories and 10 grams of carbs vs. 200 calories in a cup of cooked pasta. 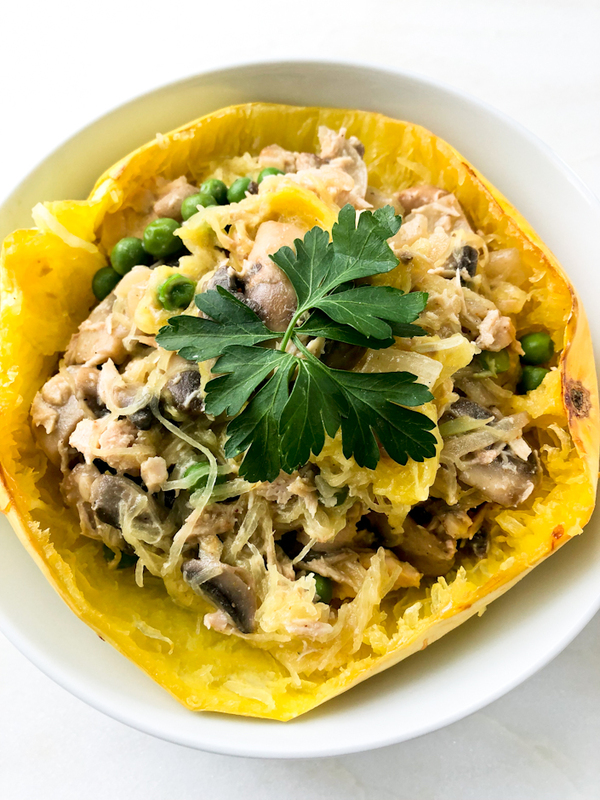 Spaghetti squash delivers a wide range of nutrients, including vitamins A, C, Potassium and Calcium and is loaded with fiber, helping to keep you fuller longer. It also contains omega-3 and omega-6 fatty acids which prevent heart disease, inflammation, arthritis and different types of cancers. Showing you here how I cut the squash lengthwise and scooped out the seeds. Then spray with some olive oil, and place face down on a cooking sheet. I’d say this is a powerhouse of a vegetable! I hope that you enjoy it as much as I did! I made it last week and had a number of my client’s try it out and they, too, loved it! Feel free to play around with the protein that you use. If you don’t like tuna, substitute salmon, chicken, ground turkey, tofu or keep it a vegetarian dish of all veggies! The combination of all the flavors is this recipe make it super delicious….I hope you give it a try! Please let me know what you think! -Heat oven to 375 degrees. 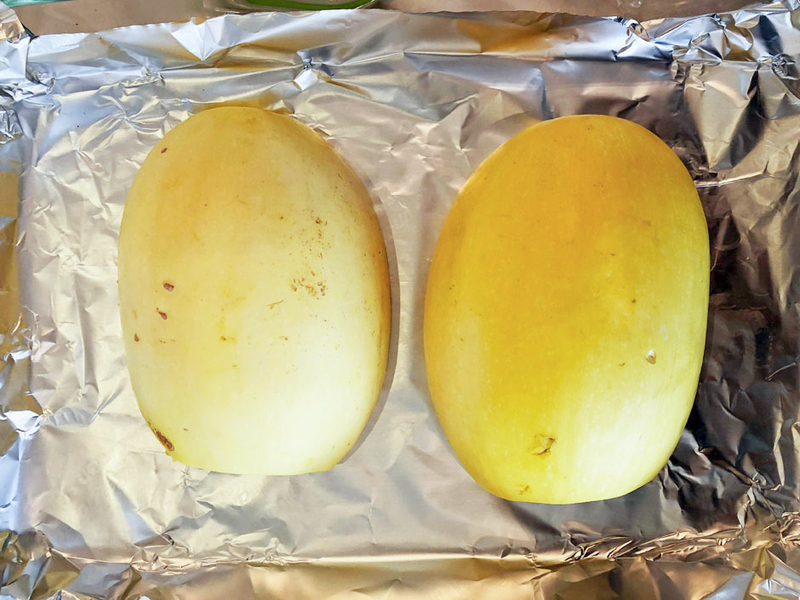 Chop spaghetti squash in half length wise, scoop out seeds, coat with olive oil and place on a baking sheet, cut side down. Bake for 40-45 minutes or until you can pierce a fork through. -While squash is baking, prepare the sauce. Add oil to a medium pot on medium-high heat. Add onion, garlic, salt, pepper, cayenne and nutmeg. Cook, stirring often until onion and garlic are aromatic. -Add the mushrooms and cook until they are soft and onions are browning a bit. -Add in the coconut milk and cook on medium/high until the sauce has reduced in half, becoming more of a gravy. Stir consistently for about 10 minutes. -Once cooled, add in the peas and tuna and mix together. 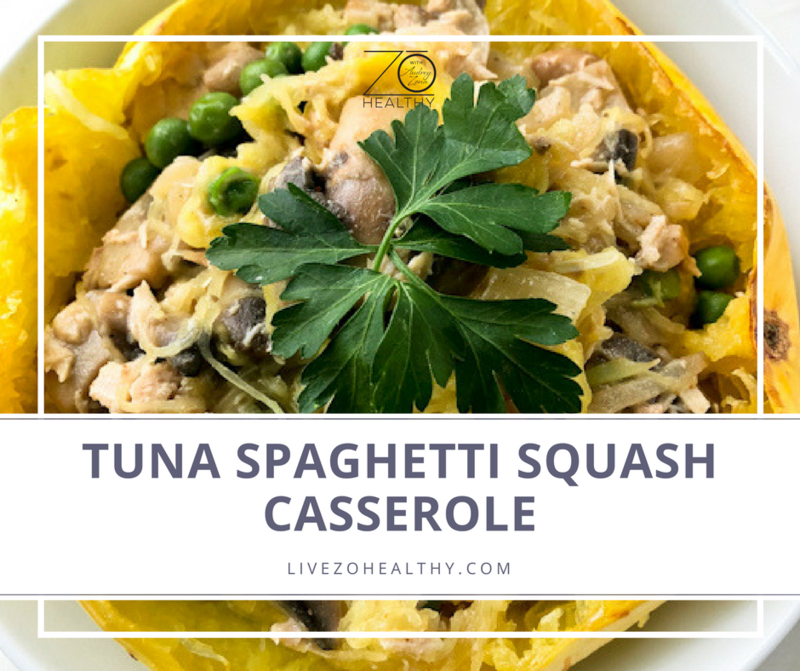 -Once the squash is cooked and cooled a bit, scrape the insides and add to the tuna mixture. If the squash is liquidy, place in a colander to remove any excess liquid before adding to the tuna mixture. -Toss together until combined. Spoon the mixture back into the bottom of each squash half and place into the oven to warm up, if desired. -Remove from oven after 10 minutes, top with parsley and enjoy! -As another option, feel free to use chicken, salmon or ground turkey as your protein, or just keep it to the veggies for a vegetarian meal!